The KHBC story is incredibly complicated but here are the basic details. The original construction permit in 1936 was for KWFB on 1210 kHz in Hilo. It actually signed on, after modification, as KHBC on 1370 kHz with 100 watts on May 1, 1936. Down through the years it changed ownership and frequencies and finally became KPUA on 970 kHz which is now on 670 kHz and is owned by New West Broadcasting. Not really the original station any more. The KHBC call stood for Hilo Broadcasting Company . KHBC is now the call of TV channel 2 in Hilo which is but a relay for KHNL TV in Honolulu. When Buddy Gordon bought KAHU he got permission from KHNL to use the call KHBC simply as a “moniker” for KAHU 1060 but the legal call is still now KAHU. FCC rules allow a station to call itself anything it wants to as long as a “real” legal ID is done reasonably close to the TOH. 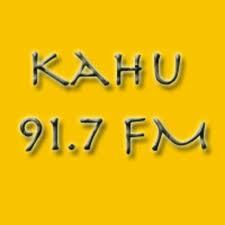 So the ID is done like this, “KAHU Hilo is now KHBC, Hilo’s original Radio Station” along with a portion of the song written especially for KHBC back in 1936, the “KHBC Hula”. And, Buddy Gordon calls himself the Hilo Broadcasting Company. He doesn’t exactly claim to be the original station but claims they act like the original one what with all the different format structures and music and being strictly live and local which they certainly are. It is one neat and unique station! Really pulling in the listeners with it’s new 5 kw transmitter. There has been a bit of a local flap over the call and Buddy’s usage of it. New West Broadcasting is making noises but that is too bad. Once Buddy works out the details with KHNL Television he will apply to the FCC for the KHBC call sign and make it official! Now, is that all perfectly clear? Buddy Gordon’s roots in Hilo radio go way back to the original KIPA “Rainbow Radio” run by his father. And of course Alan Roycroft was “silent partner”as he owed much of the equipment and did right up to his untimely passing. In recent years Buddy made the mistake of bringing in partners (Peris Corporation) in order to finance expansion plans and they became “Big Island Radio” and as time went by Buddy lost control and was pushed out. And being a radio man he went to work and got KAHU and the rest will be history for sure! That’s the story as best I can relate it in the space and time available.